Louise Redknapp, 44, sported striking red lipstick as she pulled a seductive kissing face expression to the camera. The mother-of-two kept her eyes closed as she gave her 611,000 Instagram fans a glimpse of her radiant complexion. 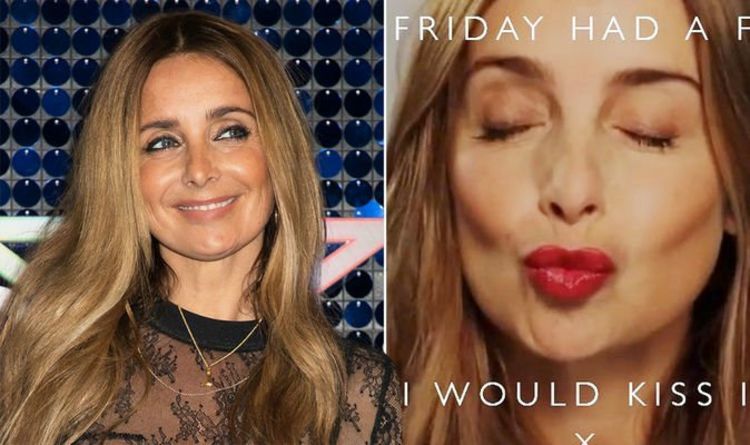 Louise captioned the picture: “If Friday had a face, I would kiss it.” Louise’s cheeky post prompted many of her fans to leave a comment. Louise’s post comes in the midst of her rehearsals for hit musical 9 to 5; a show based on Dolly Parton’s career and greatest hits. The singer will make her debut on the stage tomorrow after postponing her stint due to a nasty fall which left her injured last month. Earlier this month, Louise hinted at uncertainty for the show as she insisted she was yet to learn her lines. Charlie pointed at Louise telling her fans: “She’s got this”. Louise gave a puzzled look to the camera before hesitantly adding: “I hope I’ve got it”. Elsewhere, Louise recently discussed her relationship with ex-husband Jamie Redknapp, 45. The pair divorced back in 2017 after 19 years of marriage but have remained friends and co-parent their sons Charley, 14, and Beau, 10. Speaking on Heart radio, she referred to the football pundit as her “best friend”. In a chat with Jamie Theakston and Lucy Horobin she said: “It’s been really tough. But I mean, you know, he’s my best friend. Jamie’s dad and football legend Harry Redknapp recently spoke out about the pair’s split admitting he didn’t see it coming. He told Express.co.uk: “That was obviously a difficult time for us.